I had been struggling to find a small terminus to fiddle-yard track plan that would be believable in a Ffestiniog context. Iain Rice published an article called 'Pont Croesor' in Model Railways Illustrated (MORILL) and I knew instantly that I had found my layout. It is interesting to operate, not being a 'proper' terminus with the quarry tramway wandering across the main running line, reminiscent of the goods siding at Tan-y-Bwlch before preservation. 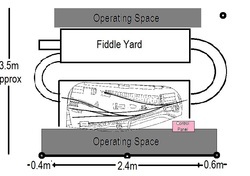 Originally the model had a cassette-type fiddle-yard at the 'downhill' end of the layout, with a much smaller one for the quarry tramway. For home use, mainly one-man operation, this was fine and the railway ran in this form until Glasgow 2011. The heat and air-con of the Scottish Exhibition Centre caused the cassette to bend and the hump backs caused all sorts of uncoupling problems. So, a new 'marshaling-yard' was built, with curved boards at each end. This also allowed for a continuous run, which was remarkably helpful when running-in locomotives. It ran in this form at Narrow Gauge North and all following exhibitions.. The down-side was that it almost doubles set-up time. However, this format was not manageable at home. The footprint it required was almost the total floor-space of the workshop; movement only being possible with a crab-like shuffle. So, as a home layout, the following format evolved. This gave more of a feel of a real railway with trains leaving the fiddle-yard, running over the Cob-bach, passing another train at Dinas Manod, before finally arriving and running round at the terminus. This required a couple of new sections. Take-down and re-set-up times are also greatly extended and were the main reason for Rhyd's retirement.